Setaria viridis (L. ) Beauv. Culms: Erect or ascending, often bent near bases, hollow, mostly glabrous. Blades: Flat or folded, 2 to 10 inches long, less than 1/2 inch wide, glabrous, slightly rough; tips tapered to long points. Sheaths: Shorter than internodes, flattened, glabrous or rough; margins fringed with hairs. Ligules: Short, dense fringes of hair. Inflorescences: Panicles, cylindric, 1 to 5 inches long, to 1 inch wide, upright or sometimes nodding; rachis hairy; branches numerous, very short, bearing mostly 5-6 spikelets. Spikelets: 2-flowered, rounded, but with 1 side flat; bristles 1-3, arising at bases of spikelets, barbed, 3-4 times longer than spikelets. Habitat: Disturbed sites, waste areas, cultivated ground, roadsides, and lawns. Forage Value: Green foxtail provides fair forage value when young, and birds eat the seeds. Comments: Tufted. This common weed is one of the first plants to appear in newly disturbed areas. 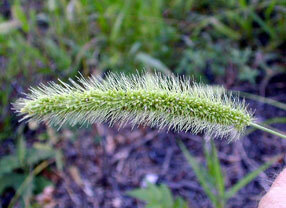 Setaria comes from Latin seta "bristle", in reference to the inflorescence. Compare with yellow foxtail and giant foxtail.